Students share the gospel along Cinco de Mayo. Imagine a flea market, a discount strip mall, and a busy downtown street crammed together. Hear the bursts of Latin music, loudspeakers promoting various businesses, children crying, gears grinding, and vendors pitching their wares. What do you have? Cinco de Mayo—not the Mexican holiday, but a pedestrian mall that forms the end of Avenida Central in Panama City. What else do you have? A constant stream of spectators. Back in May, the team I came to serve had learned Awe Star’s pantomime drama, “Freedom,” which shares the gospel from creation through resurrection to the accompaniment of a musical and (in this case) Spanish-language track. The evening they arrived in Panama, the team spent time refreshing their parts. And now, after a morning of worship at La Communidad Church, the group ate the first of many PB & J lunches and headed out for the first afternoon of official ministry. On my last Awe Star trip, I’d played a part in the drama. This time, I had the privilege of watching and serving the team. Heat radiated from the concrete as we set up the first drama site in front of a busy market. Fingers fumbled as masks, streamers, and other basic equipment traveled down the line of missionaries. Before each presentation, one person introduces “Freedom” and another one or two share a personal testimony. At the drama’s close, the introducer also explains the drama and how it relates to the gospel. 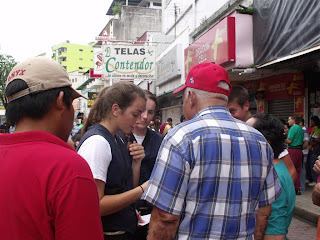 Students then head out in teams of three to share the message of Christ with those who want to hear more. Today, Awe Star leadership did most of the speaking. Tomorrow, all that would change. We knew team members were nervous about their ability to remember their parts and perform well. But we also knew they had to push past their fear so the message could go forth. What a privilege to watch that come to pass! Of course, the day’s performances weren’t polished or perfect. But I loved watching the students and adults give their best efforts. I loved seeing them walk up to people who didn’t speak their language and attempt to share what God could do in their lives. And I loved the unseen part of my assignment as well. Yes, I folded streamers, passed out ministry packs, and did other tasks that helped the team move smoothly through the streets. But my special task that day—and every other day—was praying for the team as God moved in and through them. I had the quiet joy of looking out at audience members and asking God to touch their hearts. I had the privilege of standing against the enemy’s attacks. If a team member seemed distracted, I prayed for her to focus. If another looked tired, I asked God to give him strength. At the day’s end, some of the students shared their stories. One group had led three women to Christ who were visiting from Columbia. Only God could have sent them from one country to another to that specific place at that exact time to hear a team from a third country share the good news. And only He could claim credit for the results. Walker Moore’s teaching refers to those moments as “divine encounters” when God sends a willing witness to meet a seeking soul. In those moments, he says, the obedience of the willing witness often results in salvation. That day, we had the privilege of seeing many divine encounters and numerous salvations. As I finished my day the way I began it—in prayer for the team and the beautiful people of Panama—I couldn’t wait to see what else God had planned.